Views of one of the artifacts. These slipspace artifacts were three Forerunner devices located on the shield world Requiem. The artifacts were gray-black, roughly rectangular objects, vaguely resembling a table or sarcophagus. When activated, patterns of orange hard light pulse across their surfaces, and a glowing Forerunner symbol appears above their center. 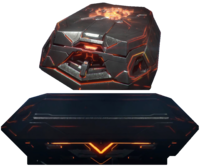 The devices lack any obvious interface, but upon physical interaction with a Reclaimer, an invisible field around the object glows orange at the point of contact. The artifacts demonstrated a wide range of properties, functioning as translocation terminals, communication devices, and, when working in concert with one another, they were able to generate an interdiction web, a powerful slipspace anchor, suspending any ship with one of the devices on board in place. In early 2558, several Covenant archaeological teams began looking for the artifacts on Requiem. The Covenant determined that one of them was located in The Cauldron, a region of artificial volcanic activity; after arriving there, they immediately secured the area and began looking for the artifact. Fireteam Crimson arrived later, after they discovered the artifact's location from a map found in an area known as "The Refuge". Upon eliminating Covenant and Promethean forces in the area Crimson found the artifact and moved to secure it. While awaiting extraction, Promethean reinforcements arrived, but Crimson managed to hold them off until a Pelican arrived to extract them. Henry Glassman is pulled through the first artifact. Shortly after being brought aboard the UNSC Infinity, the artifact unexpectedly activated, emitting an orange energy pulse and began to drain power from the ship. Commander Sarah Palmer managed to temporarily deactivate it by kicking it. Dr. Henry Glassman, the Infinity's chief engineer, was ordered to immediately examine the artifact. While doing so, Dr. Glassman inadvertently reactivated it, emitting an energy pulse which soon overtook him, disintegrating and pulling him through a portal. It translocated and reassembled him inside a Covenant-held site on Requiem, where he was captured and interrogated by Jul 'Mdama's forces. Captain Lasky was almost pulled in as well trying to save the doctor. Back aboard Infinity, Dr. Catherine Halsey was brought in to study the artifact. Halsey determined that it was communicating with the ship's drive engines, which were of Forerunner design, and transmitting data of the ship and its crew to an unknown location in Requiem. Later, it was revealed that the artifact was some form of communication device, and that it was transmitting information to Dr. Halsey's data pad. Through this connection, Halsey began a dialogue with an unknown entity, which claimed to know "the truth" about the Prometheans and many other things. Subsequently, it was revealed that the entity on the other end of the communication line was none other than Jul 'Mdama, who was using the artifact to spy on the doctor and Infinity. Upon being analyzed by Dr. Halsey aboard Infinity, a Forerunner AI matrix belonging to a Promethean Knight showed images of the translocation artifact in New Phoenix, URNA, indicating that one of the artifacts was present in New Phoenix when the Didact harvested its population using the Composer. Sometime later, Spartan Gabriel Thorne personally investigated the artifact. He came into physical contact with the artifact and, consequently, was unexpectedly translocated to a Covenant-held Forerunner structure on Requiem, where he was surrounded by several Storm Sangheili. The artifact's teleportation abilities soon revealed themselves to be able to work in reverse, as it began teleporting Prometheans aboard the Infinity. The crew aboard fended them off, and Thomas Lasky ordered Infinity to be moved out of range, but it was soon found that the ship was unable to move. Analysis of the space-time around the ship revealed the artifact was working as an anchor, bending slipspace so as to hold the ship in place. Dr. Glassman, after studying a map that belonged to Sangheili Gek 'Lhar and another map found by Crimson, discovered the reason Infinity could not get out of Requiem was because the three devices connected the planet to the ship through an interdiction web. When Jul 'Mdama put Requiem on a collision course with its sun, the slipspace anchor generated by the artifacts began to pull the Infinity along the same trajectory. Fireteam Crimson was sent to deactivate one of the artifacts located on Requiem, while the other was to be disabled by Fireteam Majestic and Commander Palmer. Meanwhile, Dr. Glassman deactivated the third one onboard the ship. After many complications, Glassman and the Spartans managed to disable the devices and separate the Infinity from Requiem. The three artifacts were destroyed along with the shield world, with the third being ejected from the Infinity. Angled view of one of the artifacts. Side view of one of the artifacts. One of the artifacts aboard UNSC Infinity. An artifact attaching itself to the Infinity's floor. The artifact releasing an energy burst after the group of scientists carelessly dropped the artifact. Gabriel Thorne is translocated through the artifact's portal. The artifact hidden at the "Harvester" location. The second artifact deactivated by Fireteam Crimson. The third artifact deactivated by Fireteam Majestic. The first artifact after being ejected from the Infinity. Close-up of the symbols on one of the artifacts.